March 9, 2015, 9:24 a.m. March 9, 2015, 9:24 a.m.
A logistics company is showing business isn’t all about profit, by donating all the money in makes from its partnership with Insurance Revolution to charity. Proactive Despatch, which is based in St Helens, is signed up to the Insurance Revolution Affiliate Scheme – which financially rewards businesses that recommend Insurance Revolution to its customers. But instead of accepting the referral fee itself, Proactive Despatch instead decided to donate every penny it makes from Insurance Revolution to children’s hospice, Claire House. Holly takes a swim in the pool with a Claire House staff member. 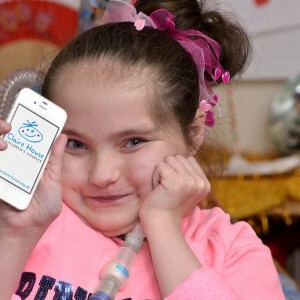 The Wirral-based charity provides end of life care for children and young adults with life-limiting medical conditions. Proactive Despatch first became aware of Claire House through the charity’s Merseyside corporate fundraiser, Tony Langan, who has known the company’s managing director for some time. Tony said: “I first got involved with Claire House when my little boy, Harvey, was diagnosed with a genetic condition. We were told it would severely shorten his life. “It is a home from home for families with children who are suffering from terminal conditions. “They are there to support families through every stage of their child’s illness and support them with end of life care. “They also continue to support families after their child has died through their specialist counselling team. Jasmine enjoys some time on her phone. Tony said Claire House could not survive without the help of its ‘wonderful supporters’, as 90 per cent of the money it requires comes from voluntary donations. “It is amazing now to have all the team from Proactive Despatch on board with supporting Claire House, some of them recently visited the hospice to see firsthand the great work that we do,” Tony added. John Diver, Insurance Revolution’s affiliate and insurer relations manager, praised Proactive Despatch charitable initiative. “Obviously our affiliates can use their referral fee however they please, but we’re really impressed that Proactive Despatch are putting the money to such good use, especially having visited Claire House myself and seen the great work they do,” said John. Paul Woods, managing director of Proactive Despatch, added: “As a business we have a responsibility to do some good in the community and this is a great way of doing so. For more information about Claire House visit claire-house.org.uk. For more information about Proactive Despatch visit proactivedespatch.com. If you are interested in the Insurance Revolution Affiliate Scheme, or would like to donate your referral fee to a good cause, visit our Affiliate Scheme page or email affiliates@insurancerevolution.co.uk.